Almost all of India’s marine fisheries are in the fishing industry, inland fisheries are mainly aquaculture, accounting for 77%. India fisheries in addition to providing livelihood security for about 14 million people, but also one of the main means of foreign exchange income. 2009-2010, foreign exchange income of Indian fishery is about 84 billion rupees, accounting for 14% of agricultural exports. Indian seafood produces is about 4.7% of the world’s total aquatic products, accounting for about 2.5% of the global market for aquatic products. Indian fishery development with an average annual growth rate of 4.5%. Fisheries accounted for about 1.07% of the total GDP of the country, accounting for 5.4% of total agricultural GDP. India’s fisheries minister, J. Mercykutty Amma, said the government is working to encourage the development of freshwater aquaculture in India to address the growing depletion of marine resources. There are four important rivers: Ganges RIver, narbada, Godavari and Krishna rivers, most fish ponds are in the four rivers’ basin. The nutritional security capacity of the country from Indian fishery is increasing day by day. At present, the national fishing, aquaculture fish and shellfish production have been more than 7.8 million tons, it has increased by more than 10 times in 5years. 1950-1951, India inland fisheries production accounted for only 29% of the total output, while accounting for more than 55% now. India’s marine capture fish production ,increased from 520,000 tonnes in 1950 to 3.15 million tonnes in 2007. The bulk of the catch comprises oil sardines, followed by penaeid and non-penaeid shrimp, Indian mackerel, Bombay duck, croakers, smaller quantities of cephalopods, other sardines and threadfin breams. This fully demonstrates the great contribution of inland fisheries. 1.Support from the government, India government plans to invest $19 million to promote the development of inland fisheries and aquaculture in the country. And the government has selected 15 reservoirs in China as a demonstration point, the demonstration project fully considers the local ecological environment, water supply and demand and other comprehensive factors. 2.More and more Indians get the skills of fisheries, like environment effect, water quality, how to treat and prevent fish diseases, and how to start a small scale fish farm. 3.Because the price of fish feed on the market continues to grow, most fish farmers begin to make fish feed by own. 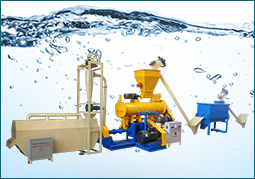 Low cost has aroused a lot of people’s interest in fish farming, there is little doubt that the fish feed processing equipment is very important for fish farmers. 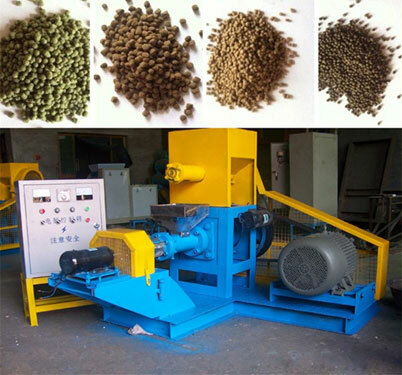 On 1st July, 2016, a catfish feed pellet line was exported to India, this line includes fish feed crusher→fish feed mixer→feeding machine→twin screw fish feed extruder→conveyor→multi layer drying equipment→seasoning machine→pellets cooling machine→vibrating screen→pellets packaging machine. Our this customer has a big scale catfish farm, because the fish feed prices on the market have been soaring, high cost caused the profile is getting lower and lower, he decided to invest in a fish feed processing plant, can not only supply their own fish farms, but also be sold in the market. 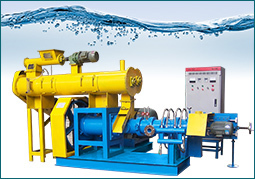 DSP200 of wet type fish feed extruder was exported to India on 6th, September, 2016, the capacity of this machine is 3.0-5.0t/h, it’s a big model, suit for fish feed manufacturers and big scale fish farms. This extruder need a boiler to produce, and the feed pellets made by the wet type extruder are smoother and possesses a better quality. 360 of fish feed crusher with 150-250kg/h capacity, 250 of fish feed mixer with 250kg capacity, and DGP60 of dry type fish feed extruder with 120-150kg/h capacity were exported to India on 15th, October, 2016. (If you want to make fish feed by own, before extruding the material, fish feed crusher and mixer are important to cut and mix the raw material.) This buyer with his partners came to visit our factory, our professional technician showed them the operation principle and procedure of the machine, they were very satisfied with our machines. Indian agriculture is also get a great improve, so it is easy for farmers to get fish feed raw material like wheat, soybean, corn straw, rice straw, peanut vine, peanut leaf, sweet potato vine, sweet potato leaf, ryegrass, alfalfa, and tung tree leaves as the main raw material. So more and more fish farmers are apt to making fish feed instead of purchasing from the market. And so it is in other countries, pellet making machines exported to Uganda on April 28th, 2016. Dry type feed extruders exported to Nigeria on 11th, December, 2015. Feed pellet plant exported to Bangladesh on 24th, June, 2015. 1. The cutting structure is very advanced with cutter shaft fixed spring to cut to realize infinitely speed change; the final output product can be cut freely in different length according to requirement. 2. Novel design, unique, simple structure, easy to install and operate. 3. The Screw is made of special wear-resisting chromium aluminum molybdenum after tempering, heating and formed, it’s with the features of wear-resisting and long life. 4. In order to ensure quality and capacity, there is special pressurization die device. And the electric heating device improves the feed expansion rate. 5. The main motor is Y-Series three phrase motor. 6. The floating pellets will float on the water for about 12hours without spreading. The pellets is no pollution and easy for working members to observe. The materials is health and easy for fish and poultry to absorb. 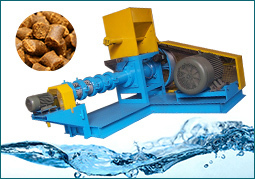 Usually if use floating pellet feed can save more 8-15% feed than using powder feed. 7. Grain materials could be such as wheat, soybean, cake, other leftovers, etc., different molds are available to make pellets of different diameters (0.9-15mm) and shapes. 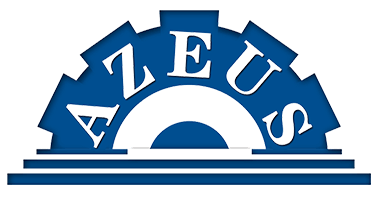 The crusher’s bearing bears all the load of the machine, so good lubrication is very helpful to the bearing life, it directly affects the service life of the machine and the operation rate, thus requiring the lubricating must be clean, the seal must be in good condition, some main parts need oil: rotary bearing, roll bearing, all gears, and movable bearing, sliding plane. The installation of the new wheel band must be examined often to prevent from loosing. Pay attention to check the wear degree of easily wear parts, replace the worn parts timely. The dust should be removed from the plan of chassis, in order to avoid the movable bearing cannot move on the under frame when having hard material cannot cut, resulting in serious accidents. When the bearing oil rise to high temperature, user should stop and check the reason to be eliminated. If there is an impact on the operation of the rotation gear, it should immediately be stopped the inspection, and eliminated.